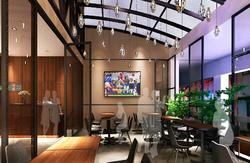 Imagine, a premier hostel within Kreta Ayer, the heart of Singapore Chinatown. Best location Nearest to General Hospital, MRT to Airport. $1 upwards breakfast at ServiceWorld Restaurant. ServiceWorld at Kreta Ayer, a historic corner where the Chinese first settled in old Singapore. 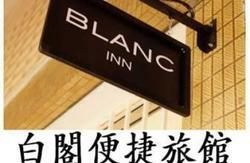 Cheapest Chinatown accommodation, FREE High Speed Internet broadband access. Enjoy your breakfast in the Restaurant at $2.00 to $5.00 Chinese or Western food. 24 hr. laundromat available . There are only three hostels within Kreta Ayer, of which two belong to ServiceWorld . It is a well established Board & Lodging budget backpackers hostel , specially featured in 2011 on TripAdvisor.co.uk and on National Television. The ServiceWorld Hostel was awarded various top prizes - Top Rated Hostel by Hostel World in 2009, Best Staff Award in Nov. 2008, and Best Atmosphere Award in February, 2009. The Hostel features a ServiceWorld Heritage Restaurant and Bar and a world class Photographic Gallery, adjacent to the ServiceWorld Hostels. Top location in the Central Business District and Historic Chinatown. the hostel is close to two MRT stations and the Buddha's Tooth Temple and HarbourFront. A choice historic budget hostel with a gallery and collection of historic creative works of Yip Cheong-Fun, who was elected in 1980 as the Outstanding Photographer of the Century and awarded the 1984 Cultural Medallion, the highest national award for art and culture. A new cocktail and reading lounge is the latest attraction to the Hostel. Max. Nights = 14 nights. Feel the exciting ambience of Chinatown and stay close to several famous tourist spots, including the Buddha's Tooth Temple and the Chinatown night markets and the Chinatown Complex. For just S$22-00 per bed, you will stay in a clean air-conditioned dormitory with lockers provided and able to enjoy Al fresco seating in the balcony or dining and internet surfing and formal dinner within a restaurant setting. Free Internet Broadband 18 Mbps access is also available and laundry service, and luggage room, If you are looking for a budget hostel that gives a feeling of home amongst the few backpackers hostels in Chinatown, look no further. The ServiceWorld Hostel is your Home Away From Home - It is cosy, clean, cool, convenient and cheap - the five C's that mean comfortable stay, quality service and smart choice. Highly commended for fire safety. Open concrete structure premises with multiple linkages to fire safety corridors and stairs. Solid support and a learning experience in this Heritage Hostel and Gallery. Meet Andrew , the owner, former Director of Planning, Singapore. Enjoy Andrew's poetry and view the rare vintage prints in the ServiceWorld collection, including the photographs of Master lensman, C.F. Yip who was elected by the Photographic Society of New York as Outstanding Photographer of the Century. 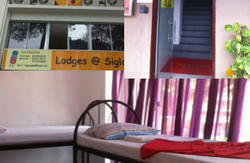 Service World Backpackers Hostel is Singapore's premier hostel for backpackers. It was awarded the Best Staff Award thru a million+ customer ratings iin Nov. 2008 by Hostelbookers and given the Fire Safety Certificate. As a hostel located in a historic district close to the Central Business District, it often acts as a central point for the discerning guest to visit numerous historic places and tourist attractions. It is well known as a starting point to explore every scenic spot in Singapore. . The Hostel is conveniently situated at Banda Street, just a short walk to the Chinatown MRT Station and the Outram Park MRT Station, providing accessibility to all the conveniences such as transportation, shopping areas, famous tourist destinations & many more! All Guests remember this hostel for its cleanliness and for its ambiance within the historic district of Chinatown and within walking distance to Clarke Quay, Raffles Place, Empress Place, Maxwell Market, Tanjong Pagar and the Railway Station to go to Malaysia. 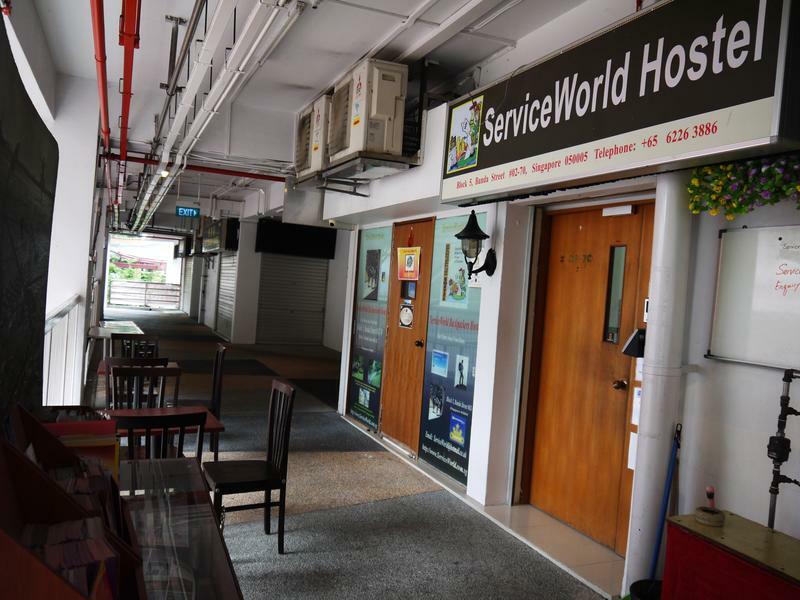 The ServiceWorld Backpackers hostels in Chinatown, Singapore, including the ServiceWorld Chinatown (Chin Swee Road) Hostel, are conceptualized as hostels with a cultural & historical heritage. The ServiceWorld Gallery, adjacent to the Hostel, is a show-case of rare vintage photographs of the world. The Hostel is ideal for the budget traveler, not just because the hostel rates are the lowest, but the prices of everything, including food and drinks, are cheap in Chinatown. The hostel location is strategic from the point of view of transportation and is most convenient for anyone who wants to explore all parts of Singapore. The hostel has been a great meeting place for travelers who love oriental history and culture. Such travelers enjoy the majestic sights and sounds of Chinatown and its numerous tourist attractions. The Hostel is newly renovated and issued with fire safety certificates. The hostel is fully air conditioned and equipped with security electronic doors, lockers and fire prevention and smoke detector and heat detector systems. Free Internet access on broadband and Wi-Fi and computer services are also provided. CCTV cameras provide maximum security outside the hostel doors and windows. In the event of 'No Show', or any cancellation where 48 hours' notice has not been given prior to check-in, the Hostel will charge for one night's stay. No cancellation of booking is allowed after registration. To get to the ServiceWorld Backpackers Hostel, take the MRT and exit from the Outram MRT at Exit B to find Eu Tong Sen Street and the building next to the MRT station, the Pearl's Centre. Walk along the whole front of the Pearl's Centre until you reach Pearl's Hill Terrace. From the traffic light junction, cross over the main road called New Bridge Road and look for Kreta Ayer Road, Walk on the left side of Kreta Ayer Road until you find a car park entrance. Follow the path, keeping to the right until you find Block 5 Banda Street. The hostel is at the back of Banda Street on the second level. If you take the MRT train to the Chinatown MRT station, exit at Pagoda Street and walk along Trengganu Street until you face the Kreta Ayer Square, between the Chinese temple on the left and the Chinatown Complex on the right. Walk up the wide steps of Block 5 Banda Street in front of you to get to the hostel. The hostel is located on the second storey behind Banda Street , facing the Kreta Ayer Community Club. There is a eating house called 'K88' on the ground floor. You could also take the lift to the second storey level.